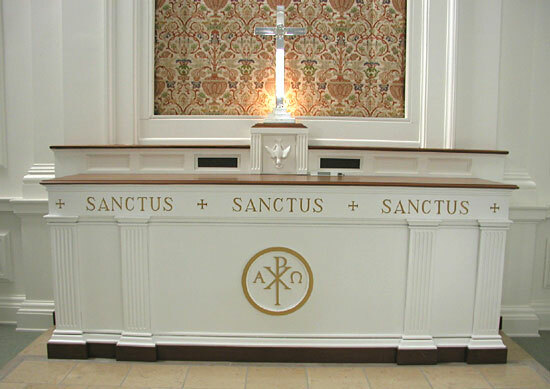 Is it time to replace or restore your church furniture? 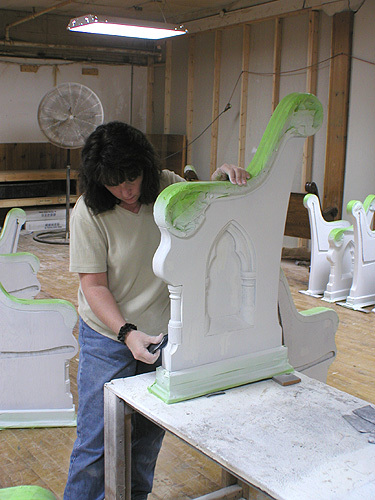 Church furniture restoration is how we got started... our expert staff has over 25 years experience in church furniture restoration processes and is dedicated to quality. 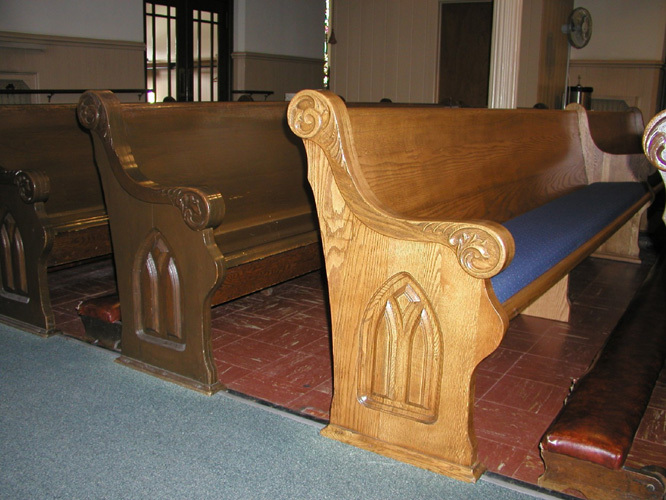 We can help preserve the architectural and historical integrity of your church by restoring your church pews to their original beauty. 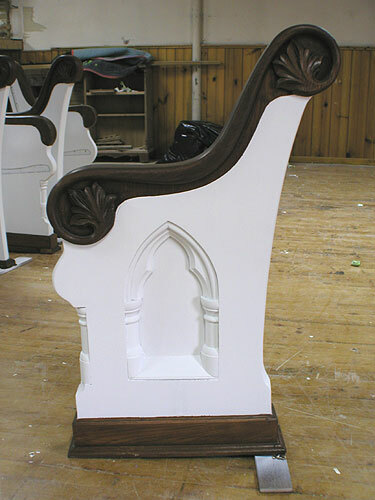 Church furniture restoration is a significant task to undertake. We'll show you the pros and cons of church pew restoration versus the costs and compromises of purchasing completely new church pews. We'll give you the information you need to make the right decisions based on your unique situation. We do each of these pew refinishing steps by hand to ensure that your church pews retain their beauty and strength for many future generations to enjoy. 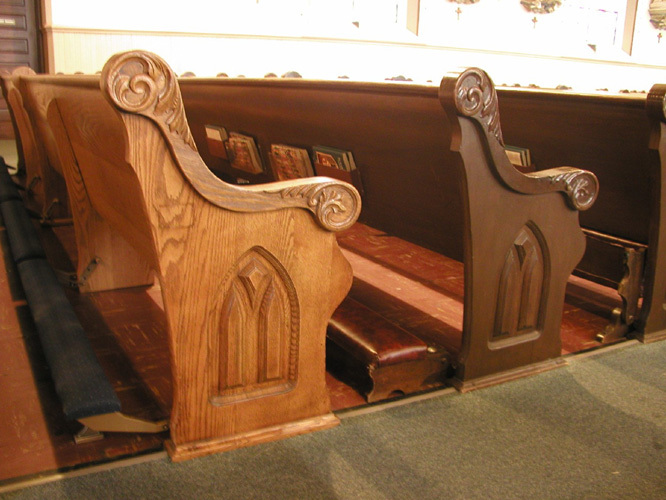 Poorly applied paint and finish can hide the natural beauty of your church pews. We can safely remove the many layers of paint and finish to expose the bare wood that lies beneath. 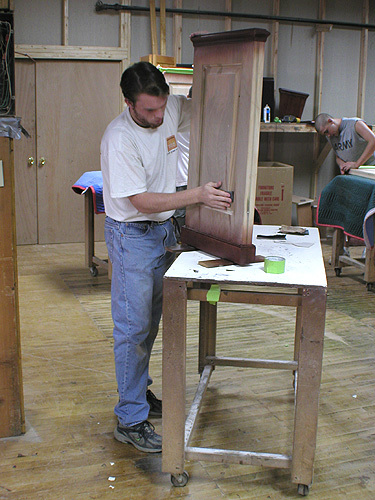 Through our refinishing process we can bring out the natural beauty of the wood. 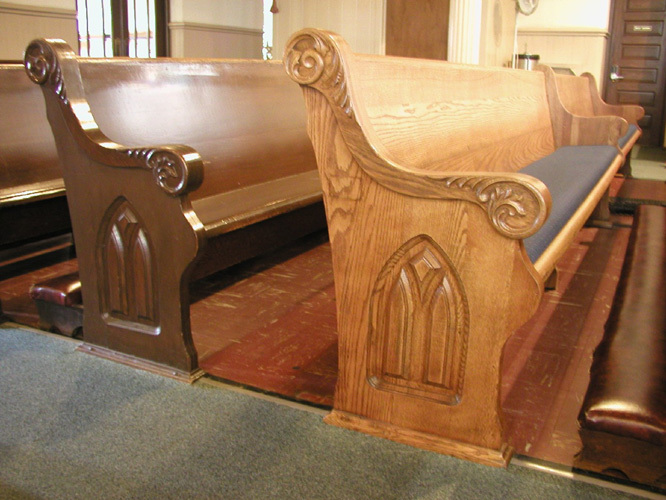 To make your church pews more comfortable, we can even install customized drop-in pew cushions, which also provide back support. 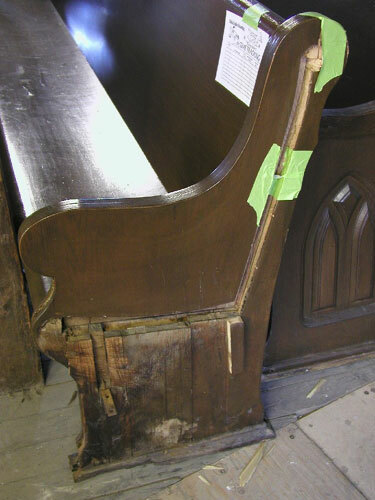 The following pictures illustrate our unique church pew restoration process. Poorly applied paint and finish can hide the natural beauty of your church pews. We can safely remove the many layers of paint and finish to expose the bare wood that lies beneath. Through our refinishing process we can bring out the natural beauty of the wood. 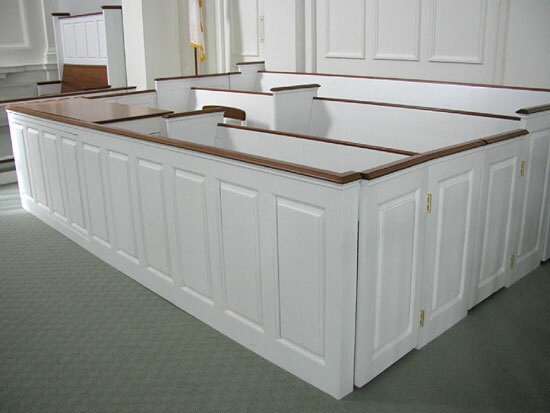 To make your church pews more comfortable, we can even install customized drop-in pew cushions, which also provide back support. As part of the restoration process, sometimes cushions or upholstery are desired. When appropriate, we offer both traditional and modern options to fit your needs. The comfort of the seat is in direct proportion to the spiritual experience. At Fredrick & Emily's, we realize that your congregation must enjoy the time they spend in your house of worship. The comfort and look of the seat is of the upmost importance. That is why we offer a full line of pew cushions and upholstery products that are durable, decorative, and fade and stain resistant. Pew cushions certainly add color, comfort and back support to pews. While color comfort is important, there are many other things to take into consideration. Choosing the style that best suits the needs of your church is a decision not to be taken lightly. Here is some information that will help narrow down your choices. 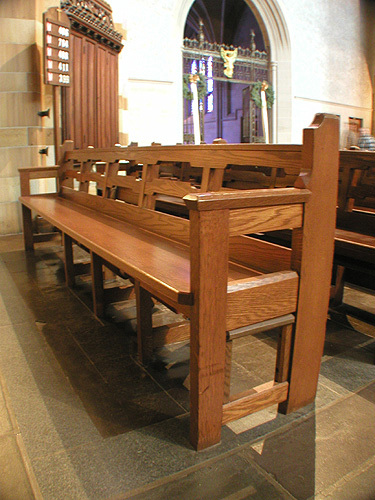 Loose pew cushions come in two styles: Stabilized Comfort and Classic. 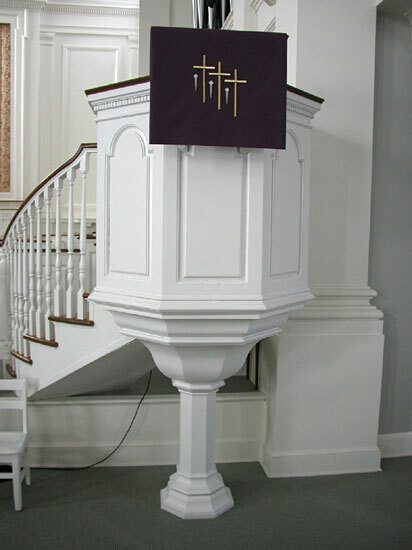 All cushions can be customized to correctly fit pews of any shape or size, attached or loose. 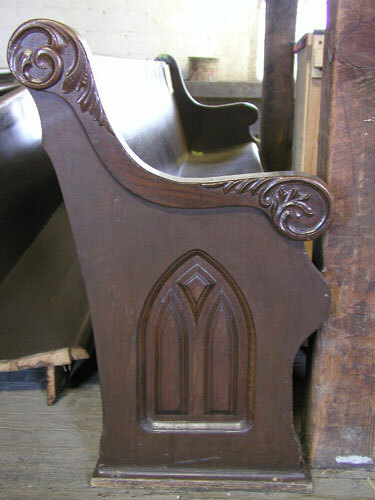 The traditional and oldest style is the Classic Pew Cushion. They may be plain or include decorative welt cords and buttons. These cushions can be a beautiful traditional addition to your pews. Non-skid foam is essential to keep these loose reversible cushions in place. Stabilized Comfort Cushions provide support and durable comfort. To create these cushions, the fabric is machine stretched to a consistent tension while being attached around the board and pad. All fabric types stay straight and resist wrinkles due to the uniform tension. The board is sized and contoured so the cushion will not slide. 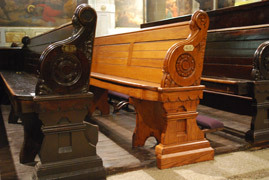 Stabilized Pew Cushions, unlike Classic Pew Cushions, can also be attached to the pews and hold there uniform, non-wrinkled appearance much longer. Attached Pew Upholstery is built onto each pew, ensuring an exact fit. 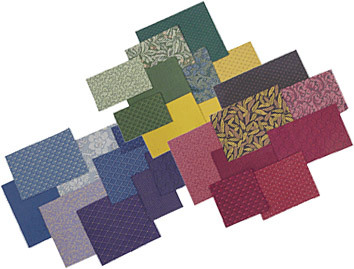 These cushions are cost effective and the quickest option, particularly for radius or curved pews. 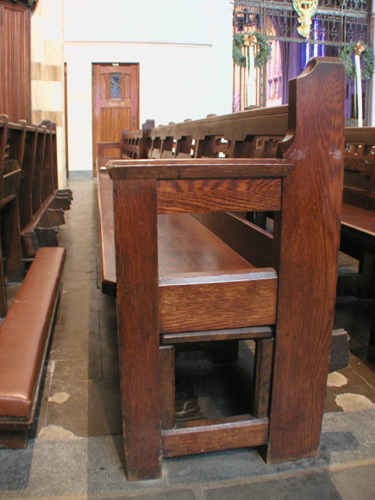 Additionally, attached church pew cushions can be installed on the seat only, seat and back, or the seat, back, and reverse side of the pews. 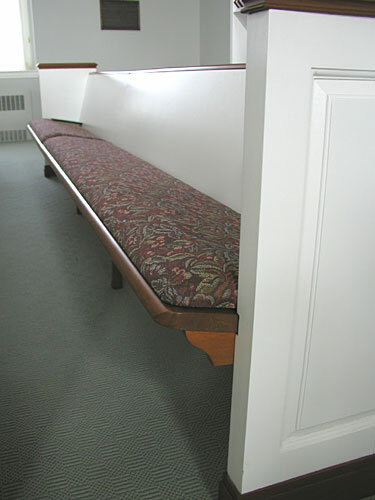 Attaching upholstery to the pew can be used to hide much wear and tear. 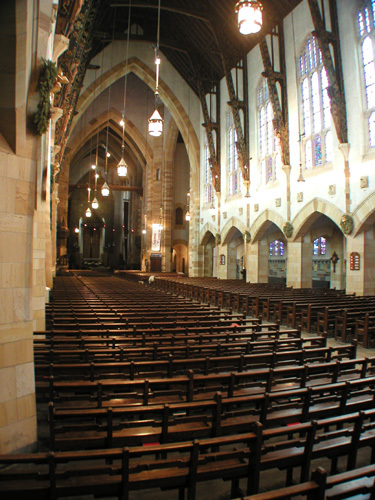 When choosing Attached Upholstery the church should be aware that the upholstery is hand stretched on site and could wrinkle over time. Repairing these cushions will require an on-site work crew. 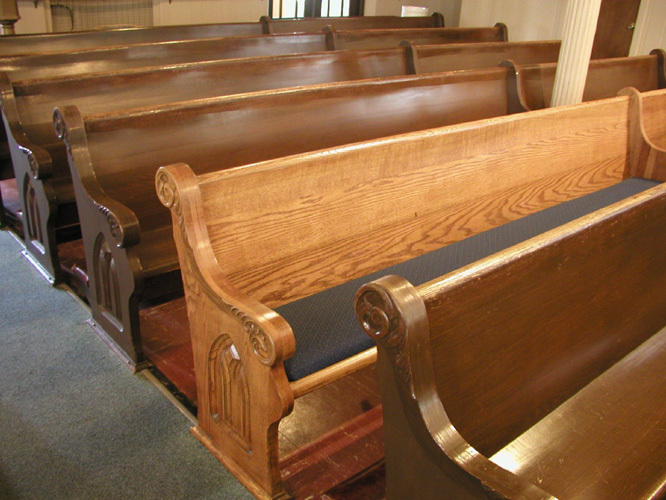 Call 717-288-2722 today and let us show you how one of the nation's leading pew renovation companies can cost effectively restore your pews to their original glory!